Pulao and Biryani are traditionally royal foods made using lots of oil, ghee, dry fruits, rich gravies, cream, coconut, curds, Paneer etc. Even simple delicacies like khichdi, though cooked in very little oil/ ghee are served with ghee poured over them! We have modified traditional recipes to a zero-oil form as well as developed a few new recipes to suit the Indian palate. But it is no easy task either! Cooking with zero oil doesn’t mean only elimination fat, it also involves careful selection of ingredients (like Brown rice or bulgur wheat instead of white rice), tweaking the proportions accordingly and using appropriate cooking methods too! 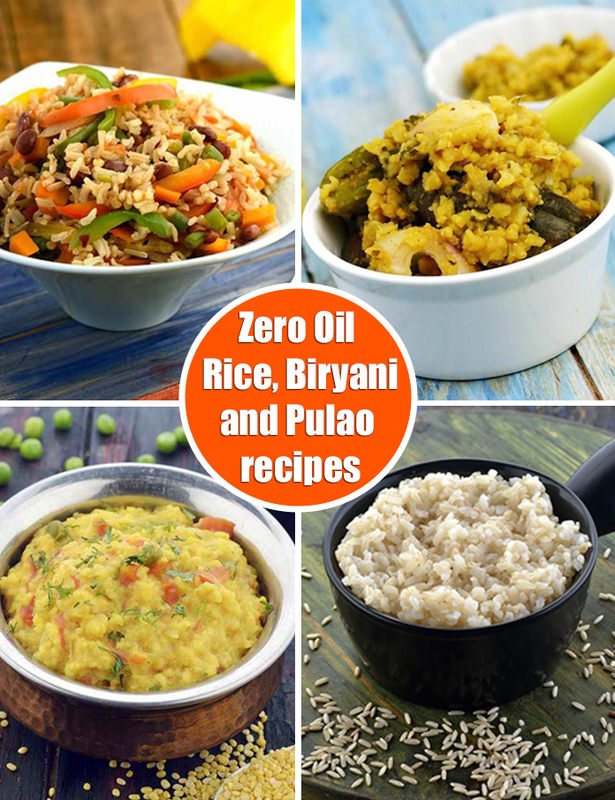 Learn the magical zero oil way of cooking recipes like Basic Brown rice, Creamy Mushroom Risotto , Handi Khichdi, Masoor Biryani and many more tempting dishes in this section. Many health-conscious people are beginning to replace white rice with brown rice in several recipes, to benefit from its additional nutrition and fibre content. Here is how you can cook Brown Rice perfectly using a pressure cooker, to make healthy pulaos and biryanis. A delicious chinese stir-fried rice recipe!